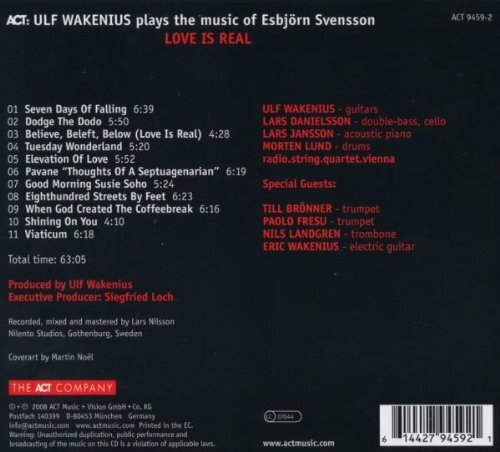 Love Is Real was not intended as a memorial to Esbjörn Svensson-the disc was recorded in 2007-but it takes on added poignancy since the brilliant Swedish pianist died in a diving accident this past June. As it happens, the first album celebrating his music comes from a countryman, the guitarist Ulf Wakenius, whose previous album paid tribute to Keith Jarrett. The tragedy and the timing of this release affect how we receive it. Much of the music floats along softly, as though it were intended for a Windham Hill compilation or as background music for the Weather Channel. Fans of Svensson’s work may find it hard to accept this idea. Yet, curiously, Love Is Real works. It’s pleasant, it’s enjoyable, and it’s appropriate. Five-day forecasts come to mind immediately with the group’s handling of “Seven Days of Falling.” Drummer Morten Lund and bassist Lars Danielsson never waver from their sheet music-Lund is downright metronomic, in fact-and pianist Lars Jansson subjugates himself to Wakenius, who turns in a nifty solo. The awkwardly named radio.string.quartet.vienna makes a few guest appearances, most forcefully on “Dodge the Dodo,” where its members scratch and claw at their strings while Wakenius plucks the theme. Wakenius’ son, Eric, sits in on the tune; his style veers toward metal, and his distorted guitar threatens to thrash and then fades out, perhaps too soon. (Could have gone for another minute of that.) Elsewhere there are guest turns from trumpeters Till Brönner and Paolo Fresu and trombonist Nils Landgren. 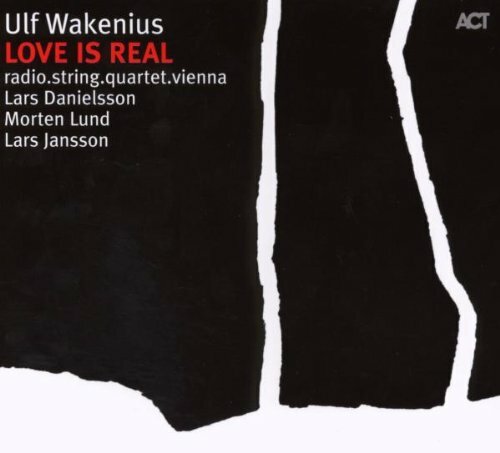 Wakenius’ arrangements illustrate how talented a composer Svensson was, because his songs work as swing, balladry, country-folk and acoustic rock-jazz. “When God Created the Coffeebreak”-one of the greatest song titles in all of jazz-becomes a romp fueled by frenetic, electronic-style drumming. Most of the album, however, is refined and restrained. One could almost call it easy-listening jazz. But it brings forth the beauty of Svensson’s writing. Clearly Wakenius heard something in Svensson’s music that some of us missed, until now.